Matt Pedersen – officially driven mad by Aiptasia, I broke down and brought out the big gun. 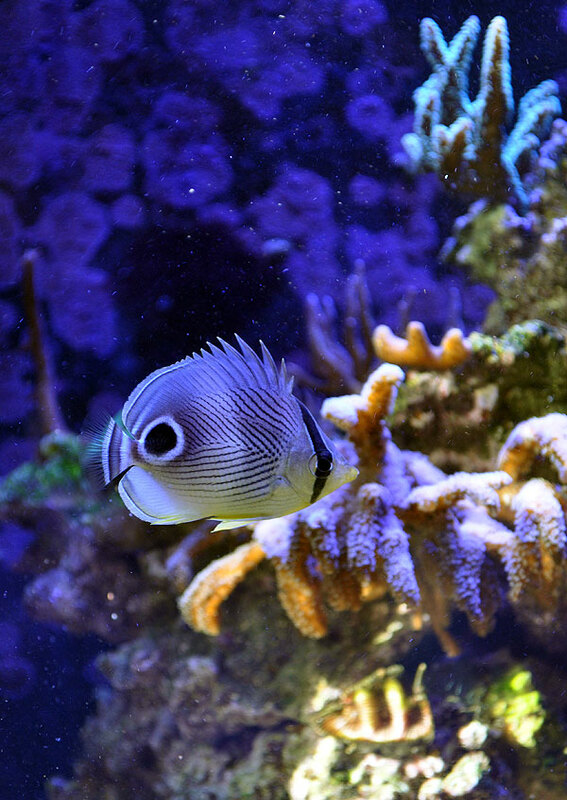 LiveAquaria.com Diver’s Den spared Four Eyed Butterflyfish, who’s already cleaned out two tanks of Aiptasia, has entered the Lightning Maroon’s domain. 2 minutes in, Aiptasia started dying. Will be documenting before & after + collateral coral damage (none is currently expected). Yes, indeed, the Aiptasia have gotten out of control. Originally found one or two that came in on frags and manually removed them – I thought I was in the clear. Sadly I wasn’t. When they started popping up, I started hitting them with a Kalkwasser slurry, but that just didn’t seem to work well. The Aiptasia marched on, so I took the next step and ordered up some Joe’s Juice. Of course, it kills them, but I’ve found with products like this that there’s potential for a side effect – in dying, they seem to propagate even more. Sure enough, what was an infestation quickly became a plague after an attempted eradication with Joe’s Juice. I had a few options. First that came to mind was Peppermint Shrimp. The biggest issue there was simply one of quarantine. NOTHING hits the Lightning Maroon’s tank without either a dip (in the case of coral) or QT (in the case of fish and inverts). Thus, for the same reason that Peppermint Shrimp were out, so too where the Berghia Nudibranchs, again, at least in the short term until I figure out whether I can get some that won’t require QT (and feeding in QT). I’m a butterflyfish fan, and there are many Indo-Pacific Butterflies that can be used for Aiptasia control. Sadly, none of those species were on hand, and they, like any other fish, would have to go through extensive quarantine. But I did have the Foureye Butterflyfish. Actually I think I have 14 running around at the moment, but the one particular specimen was purchased from the LiveAquaria.com Diver’s Den. This meant it had gone through extensive QT before ever being shipped to me. It originally lived with my Onyx Percula pair, killed a proposed mate, and wiped out any Aiptasia in the tank while leaving the rest of the coral life alone. It then moved on to another tank housing a captive-bred Latezonatus pair from Karen Brittain’s breeding, where once again, it demolished the Aiptasia population while leaving the larger Long Tentacle and Bubble Tip Anemones untouched. Furthermore, I’ve kept Foureye Butterflyfish in reef tanks with corals like Fungia, Turbinaria, and various Gorgonians – none were bothered. However, larger brown Palythoas lost their long tentacles. And, if I think back, I’m pretty sure I had some specimens in an SPS tank before, at least temporarily, and saw no real damage there either (i.e. Xenia and Montipora and whatever else was in there at the time went untouched). So it was indeed a gamble, but the Foureye had been here for months and had not shown any signs of disease. It had lived with some of my most valuable clownfish without issue. It went into the Lightning Maroon’s tank on the 26th of September, and it is doing well and taking a toll on the Aiptasia population. While not eliminated yet, their presence is reduced. The Maroon pair pushes the Butterfly around a bit, which had me concerned. However, there hasn’t been a single split fin on the Butterflyfish, so the aggression from the Lightning Maroon and her mate is largely bluff. Since introduction, I have seen the Butterfly nipping in the vicinity of a Birdsnest Coral, but I think it’s actually trying to get at some Aiptasia underneath. There has been no visible damage to any of the corals in the tank, including the Gonioporas (which I was very concerned about). It turns out that the Lightning Maroon and her mate are causing more problems for the LPS in the tank, as they’re routinely moving rubble AND frags all over the tank. Often times I’m finding the smaller Goniopora frags either burried in rubble or upside-down on the other side of the tank. Some have certainly suffered from this abuse. Even the ORA Red Goniopora isn’t opening quite as far these days, I suspect not because the Butterflyfish is nipping at it, but because the Maroon Clownfish have been dumping rubble on top of it! So…much of the “Coral Bones” rubble was pulled out of the tank on October 10th, and the rest will probably come out soon. It was a good aquascaping idea, but I was quickly reminding that a pair of Maroon Clownfish generally have their own ideas about how the tank should look.